The statement highlighted a drop of 29.8% in distribution domestically and abroad from 920.9m to in 2011 to 646.6m 2012. 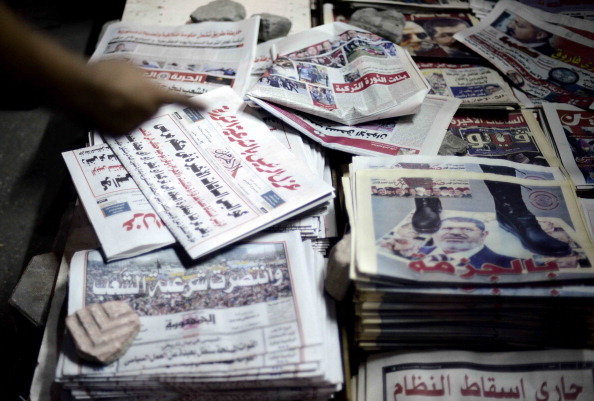 The Central Agency for Public Mobilization and Statistics (CAPMAS) announced a decline of 20.6% in the number of published newspapers, decreasing from 102 to 81 in 2011 and 2012 respectively. The statement highlighted a drop of 29.8% in distribution domestically and abroad from 920.9m to in 2011 to 646.6m 2012. According to Al-Shark Al-Awsat News Agency – based on CAPMAS Annual Cultural Statistics Statement for 2012 issued Monday – the number of and translated books and booklets filed in National Library and Archivesduring 2012 reached 10.7 thousand, while the number was 12.3 thousand in 2011 constituting a reduction of 13%. It added that the printed copies decreased 13% as well from 123 thousand in 2011 to 107 thousand in 2012. In regards to the number of publishing houses, public and specialised libraries, universities’ and academies’ libraries there was a decline of 4.5% reaching 1133 from 1186 in 2011. The statement revealed that the number of cinemas decreased by 1.7% becoming 282 halls in 2012 compared to 297 in 2011, while for theatres the reduction represented 22.5% moving from 40 to 31 theatres in 2012. Indoor theatrical performances in 2012 totaled 2116 performances watched by 389 thousand viewers generating revenues of EGP 4.6m. The statement showed an increase in cultural centres in 2012 to 559 compared to 544 in 2011 with an increase of 2.8%. The number of domestic and international conferences in which Egypt participated featured an increase from 301 in 2011 to 376 in 2012 representing 24.9% rise. Museums and parks increased in 2012 to 124 compared to 97 in 2011 with a percentage increase of 27.8%, in the meantime, the number of archeological sites decreased by 3.9% from 103 to 99 sites. For the nature reserves, they witnessed a decrease of 13.6 from 22 in 2011 to 19 in 2012.